Getting a class ring is a rite of passage. Ninth and tenth graders can’t wait until they are juniors so they can get their class ring. For many years, homeschoolers weren’t able to order class rings. Now that has changed and there are companies that make homeschool class rings. My oldest son didn’t want a class ring. Well, he would have gotten one if I had paid for the whole thing. I said he had to pay for half himself. So he didn’t want one. My oldest daughter wanted one and was willing to pay for half. She ordered her’s from Walmart. We both were happy with it, it’s a very nice looking ring. My next two students are talking about getting class rings now, so we’ve been looking around. Of course, our first stop was Walmart. You can order Walmart’s class rings online now. So much easier. 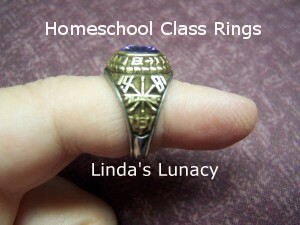 Homeschool Diploma.com is now offering class rings. They have a very nice selection in several price ranges. You can also go with Jostens. They have been providing schools with class rings for years. Their rings are gorgeous, just really expensive. There is also a huge selection of Class Rings on Amazon . Earn enough gift cards and you could even get one for free! So it is possible for homeschoolers to get a really nice class ring, with a wide price range.